Last night I finished reading The Bell Jar, the only novel by Pulitzer Prize-winning poet Sylvia Plath. 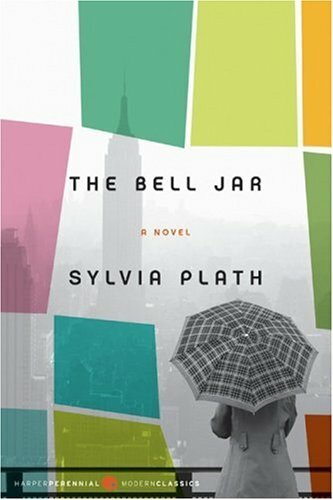 Sylvia Plath was an interesting character in her short life and this novel is modelled after many of the events in her early adult life, including being institutionalized in an assylum. The assylum where Plath was treated with electroconvulsive therapy (i.e. shock treatments) is the same hospital on which Girl Interrupted was based, written by Susanna Kaysen who also spent time there, as did James Taylor and Ray Charles. This book is a little slow moving and I think that's intentional. The story revolves around Esther Greenwood, a girl who seems to have all that she wants. She's talented, pretty, sought after by the boys and attends a good university. In the beginning of the book, Esther is doing something like an internship for a popular women's magazine in New York City. However, the slow moving pace of this book helps to disguise the downward spiral of Esther until the reader, much like her, can't figure out how it all happened. There is definitely an emotional journey in this novel that the reader takes with Esther. I feel like I finally know what it feels like to be down and out, or at least depressed. There is also a sense of getting to know Sylvia Plath, who shortly after this novel was published, stuck her head in the oven and took her own life. There is something chilling and creepy about knowing that. An interesting fact to note is that she was married to poet Ted Hughes with whom she had two children. When they separated, Hughes took up with Assia Wevill, who in 1969, took sleeping pills, pulled a mattress into the kitchen, and laid down with her four year old daughter to die with the oven gas turned on, much like Sylvia Plath. I highly recommend The Bell Jar for anyone who is interested in classics and American Literature. It's a quick and interesting read, though not for those who need something lighthearted or fun - it's admittedly a bit of a downer. I read that book a few years ago. Perhaps even in high school, which might not have been the best choice at that age. The book is so well written and intriguing, but it's so hard to read at the same time. I think this book sounds good! I'm such a sucker for those sad books. They keep me in check and show me a different perspective than the optimistic one I usually have on the world. How is Sweet Little Lies so far? It's on my To Read list. Okay, now I am intrigued and will read it. Great idea to include books in your blog - very classy indeed !